On the ledge below the overlook, the three birds huddle: a slate-gray mass. One stands slightly aloof, gazing into the distance, while a second, officious, pecks under the wing of the third. Above them the canyon air is warm, with a rising early-morning wind. Rufflike plumes ripple with the breeze. After a moment, bird three decides he’s had enough forced grooming. His wings flare: there’s a clash—open beaks, twisting necks—as he and his companion face off. Then, abruptly, he gives a single flap to his wing muscles, and steps off the rock. The five minutes that follow are pure miracle. Without once breaking his totemic immobility, the bird dips, turns, wheels, riding the updrafts from the ravine below. His feathered wingtips are fanned like palm fronds. At several points, he seems to levitate straight upward, then surrender again to gravity. At last he careens downward to the rocky outcrop, white claws splayed. A double wingstroke to brake, then the touchdown: a perfect two-point landing. Watching Andean condors on their early rounds is for many the highlight of a visit to Peru’s Colca Canyon. It’s inexpressibly thrilling to see the tiny black slits soar above the morning haze, then slowly materialize into broad panels in the early sun. But Colca Canyon is about more than just raptors. Dotted along its 65 miles of switchbacks you’ll find attractions that are amazingly varied: Inca terraces, hot springs, live volcanoes, waterfalls, scenic mountain hamlets, Andean wildlife, indigenous traditions unaltered since the conquistadors stumbled on the gorge back in the 16th century. It’s a place where weaver women knit colorful shawls the way their great-great-grandmothers did, and muleteers amble lazily along the canyon floor. To help you chart your course through this Peruvian natural wonder, here’s a primer on Colca and its hidden treasures. In 1981, Jerzy Majcherczyk was facing a dilemma. Originally, the 28-year-old Polish explorer and kayaking aficionado had planned, along with several of his buddies from Krakow’s University of Science and Technology, to travel to Argentina, where several unexplored reaches of river awaited his paddle. The goal was Southern Patagonia, where the team would test its mettle against some of the continent’s most challenging rapids. In April of that year, however, the plan hit a snag. Argentina’s borders had closed, owing to an ongoing conflict with Chile. Suddenly Patagonia was a potential war zone. The boating foray seemed risky. What to do? Consulting with his compadres, Majcherczyk decided on a change of course. The new destination, he announced, would be Peru—specifically, the uncharted rapids of Colca Canyon, a ravine that so far not even scientists had fully mapped, and whose exact depth had never been established. The expedition would combine research and recreation, scientific exploration and full-tilt whitewater adventure. What else could a red-blooded group of adrenalin junkies want? Thirty-three days after touching down in the canyon, the Canoandes 79 group, as it called itself, had made history. Not only had they navigated the entire length of the chasm, but they’d determined via scientific tests that it might be the deepest in the world. For an instant, they were celebrities. Peruvian President Fernando Belaunde received them in Lima. The Guinness Book of World Records awarded them an entry, for navigating the World’s Deepest Gorge. Alas, the group’s laurels soon faded. Not long after, a controversy sprang up, over whether the 10,469-foot canyon really merited its superlative appellation. The prime rival turned out to be its next-door neighbor, Cotahuasi, which, at 11,001 feet, edges out Colca in the depth category. Recently, other geographers have argued that Tibet’s Yarlung Zangbo, at 19,715 feet, leaves both Peruvian canyons in the dust. Howsoever the case, Majcherczyk and company’s sally remains a splendid feat. The Canoandes team leader continues to visit Peru, having been made an honorary citizen of the town of Arequipa. And no one would contest that, at over twice the depth of the U.S.’s Grand Canyon (6,093 feet), Colca is…well, grander. When you head to Colca Canyon, your starting point will inevitably be Arequipa, the “white city” in Southern Peru that’s home to the country’s second-largest population (and some of its tastiest food). During the three-hour bus ride from the city, you may be tempted to nod off. But stay sharp: two of the area’s loveliest attractions pop up even before you get to the canyon itself. The first, located some 40 miles outside Arequipa, is the Reserva Nacional Salinas y Aguada Blanca. Sprawling over nearly a million acres, this wildlife refuge is a prime place to spot Andean camelids: llamas, alpacas, and vicuñas. They’re frequently found grazing alongside the road, and their sudden movements can make for some nail-biting moments for drivers. The more daring ones will come right up to you for pictures. Further on, additional exotic wildlife can be spotted at Patopampa Pass, a 16,000-foot lookout where bitter winds rip through the razor-thin air. This is the highest altitude you’ll likely experience in the region, but it’s made worth it by the flamingos you’ll find wading through the mountaintop pools. As you cross, look for the slender piles of rocks left by the locals. Called apachetas, they have coca leaves at their bases and are intended as offerings to the gods of the Andes. From Patopampa, the road descends sharply, zig-zagging down to Colca Valley itself. Soon you’ll see the village of Chivay, a quiet hamlet on the eastern end of the ravine with enough tourist services to make it a good base of operations, but not so much as to spoil its charm. In it you’ll find accommodations, restaurants, banks, and other amenities, which you can avail yourself of as you prepare to explore the canyon. Two attractions worth visiting are the cathedral, made from white volcanic rock, and the hot springs at La Calera, located on the Colca River just outside of town. The latter has mineral-rich waters that bubble up at a variety of temperatures, as well as zip-lines that take you skittering out over one of the canyon’s gorges. Back in town, the Casa Andina Classic Colca hotel has a tiny observatory, should you feel a longing to gaze up at the night skies. Having made Chivay your starting point, you’re now ready to venture out into the canyon proper, following the trail that runs along its south rim. As you leave, you’ll pass through the quaint town of Yanque (which also has thermal baths and a nice scenic bridge at Chacapi). But the real attractions start further on, at the Mirador de Achoma. 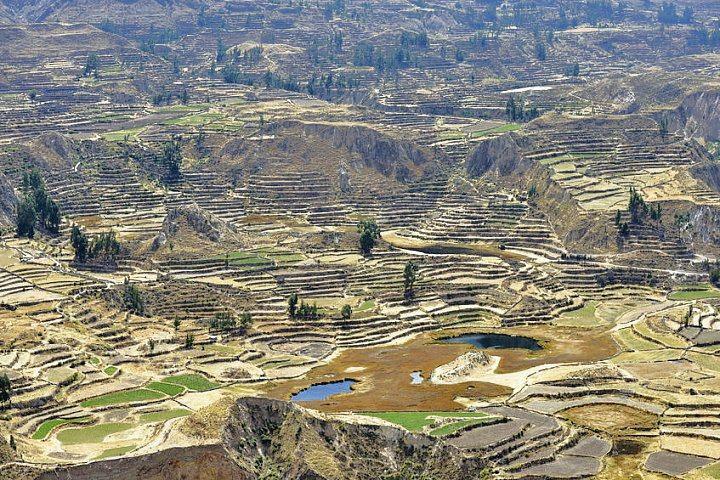 From this scenic lookout, visitors are treated to a sweeping view of the Colca Valley, complete with agricultural terraces that date back to the days of the Incas—and that are still worked by local farmers. Other views await further on. At the Mirador de Chinina, if you use your binoculars, you can see pre-Inca tombs carved into the side of the facing cliff, like mud swallows’ nests. Indubitably, though, the highlight of this part of the canyon—some would say of the whole trip—is the justly celebrated Cruz del Condor. It’s a place that’d be famous even without the wildlife. The overlook affords an amazing view of the enormous profundity of the canyon, and an early-morning haze tinges the air with the sun’s gold. The main attraction, obviously, is the 11-foot-wingspanned raptor that gives the pass its name, and with a little luck, you can spot members of the three families that inhabit the slopes nearby. Here it pays to time your visit: the best hours for condor-spotting are 8 a.m. and 4 p.m. And while you’re waiting for the big birds, don’t neglect the Andean hummingbirds and vizcachas (small, chinchilla-like rodents) that hover nearby. Thus far, your trip has stayed on the surface, taking you mainly along Colca’s southern rim. At the town of Cabanaconde, however, just a few hours’ walk from the Cruz del Condor, you’ll have the chance to get down and dirty, descending into the canyon itself. As treks go, this one is modestly strenuous. Starting from Cabanaconde, you’ll head down a rugged slope to Sangalle, a camping oasis on the canyon floor. There you can rent a bungalow and swim in one of the natural pools, or pitch a tent and spend the night. Some visitors elect to continue on along the (very hot) bottom of the valley, but be aware that if you do plan to climb back up the same day, the going is a bit rough. Allot four hours for the trudge. 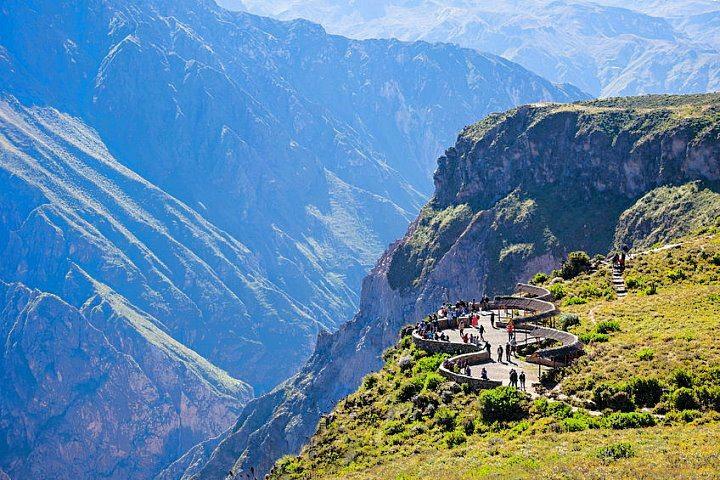 The floor of the canyon contains some of the Colca’s most rustic and charming sights. About four hours’ trek to the northeast is the village of Tapay, whose lovely country church and sleepy plaza are unspoiled by modern civilization. Here you can rent mules to explore along the river, visiting the orchards and cactuses that line the walls. The canyon has been inhabited for centuries by two groups, the Collaguas and the Cabanas, and in Tapay you’ll easily spot the latter from their beautifully embroidered vests and hats. Also worth visiting on the canyon floor is the blink-and-you’ll-miss-it town of Yawar, which consists of a lovely hotel and little else. Perched along one of the bluest stretches of the Colca River, its patio restaurant offers an unsurpassed view of the canyon’s winding course. There are also more hot springs nearby, to take the ache out of your soles after a long day. When you finally decide to return to the surface, there are numerous buses and taxis to take you back from Cabanaconde to Chivay. Some visitors choose to take the scenic route, crossing the gorge and visiting the picturesque villages of Madrigal and Lari on the canyon’s northern rim. But whatever you do, don’t leave Colca without stopping in Chivay’s central market to pick up an alpaca sweater, belt, or hat made by one of the local weaver women. Famous throughout Peru for their quality, these handicrafts are the perfect keepsake for your trip into Peru’s greatest non-Inca wonder.